Nothing says Victorian like a classically beautiful gemstone stone ring. 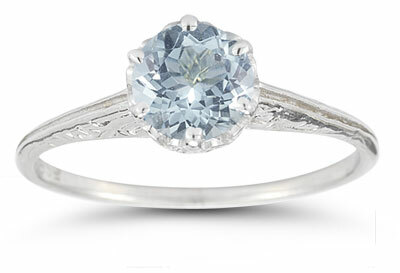 Let Apples of Gold fill that jewelry void with this antique-style aquamarine ring. The light blue gemstone is round cut to maximize the shimmering effect of the facets. To keep this jewel in place, six solid 14K white gold prongs are fashioned in the best of Victorian style. A gleaming white gold band brings delicate engraved patterns to the ring, completing this absolutely timeless but undeniably romantic look. We guarantee our Vintage Prong-Set Aquamarine Ring in 14K White Gold to be high quality, authentic jewelry, as described above.